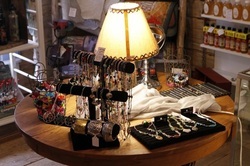 We have GREAT prices on fun jewelry and on Sterling Silver! Looking for real copper or copper and magnet bracelets? Look no further, our prices keep you happy. Copper bracelet is just $9.95, copper with magnet is only $15.95. We also carry one of the largest selections of fun bracelets around!! Prices start at $2.95! We also carry beautiful, clear, high quality (AAAA)CZ, Platinum plated Sterling Silver rings, WOW! Ask me about the savings I can give you for Tungsten wedding bands! Men's or Women's. Prices start at $--call me, too low to advertise! This is way more full now!! Come See!